2 deer in 2 days!! What a huge blessing! This 1 1/2 yr old doe came in at 9am with 2 others. They were feeding heavily on acorns. She quartered away and I got her right in the heart. Re: 2 deer in 2 days!! way cool - Great Day - hey that is a nice bow too - what is it. Wow. Congrats. Looks like you are having a good season. Good shot, great job ! It's made by Rivers Edge. Specs are 62 long and 52@28(or 50ish at my draw). Nice shooting "D" bow with mild R/D. Antler tips and rattler skins to boot. :D I got this bow from Nakohe this summer and it's proven to be a good one. Nice job Arwin...looks like you're getting back to business! 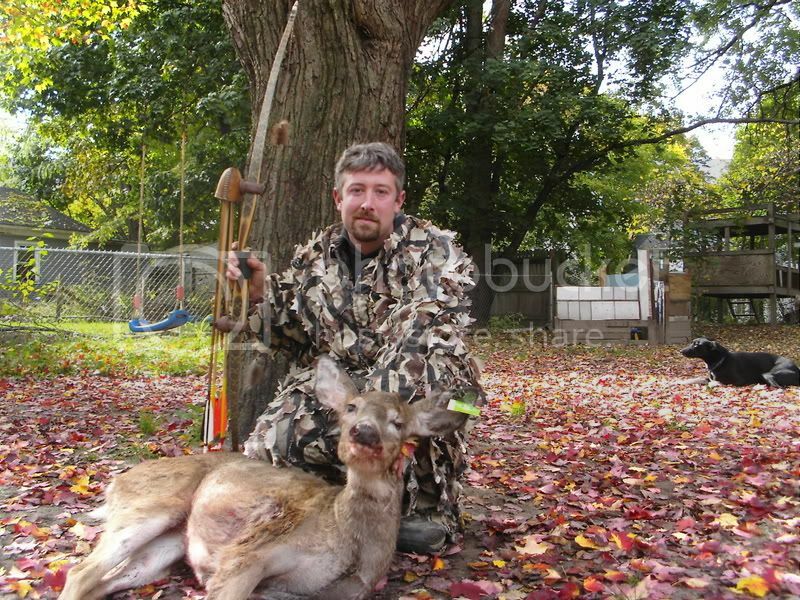 Another nice doe, well done Arwin!